Press Release, March 23, 2016, Sydney, Australia: NSW Health Pathology, an Australian public pathology organization that operates five clinical and scientific networks, is using radio frequency identification technology at a blood bank it runs at Liverpool Hospital, near Sydney, to track blood products from the time they leave storage refrigerators until when they are returned to storage or used for a patient. The RFID system, consisting of SpaceCode‘s SmartFridge, tags and software, was provided by Australian technology distributor Wishmed. 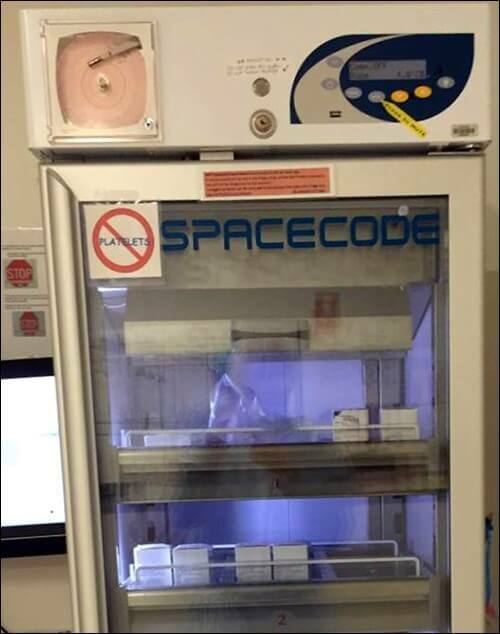 SpaceCode’s SmartFridge has a built-in RFID reader for identifying which bags of blood have been removed or returned, as well as when and by whom. The solution includes a locking SpaceCode SmartFridge, installed in the hospital’s surgical suite, to identify RFID-tagged blood products stored within it. The system not only helps to ensure that each unit of blood is given to the correct patient, but also that it is not used after an extended time out of refrigeration. For each surgical procedure in which a patient requires transfusion, staff members pick up units of blood from the NSW Health Pathology blood bank lab and take them to the operating department’s SmartFridge, where they are stored until needed. When required, the blood is removed from storage and taken to the patient for transfusion. If the blood products are not used, they are returned to the blood refrigerator. The following day, unused blood is picked up and taken back to the main blood bank laboratory. “We need to be assured that the returned blood is safe to use, and require cold chainrecords to confirm that it has been appropriately stored,” says Tony Greenfield, principal hospital scientist at the NSW Health Pathology’s Liverpool Blood Bank Laboratory. Normally, blood removed for less than 30 minutes is considered safe, while blood that has remained out of a refrigerator for more than that amount of time is deemed unsafe and must be discarded. Prior to the RFID deployment, a sign-in and sign-out book attached to each refrigerator was used to track the products and monitor how long they remained outside controlled conditions. “Unfortunately, this wasn’t always reliable,” Greenfield says, noting that the records were often incomplete. When this occurred, he adds, the blood needed to be discarded as a safety measure. SpaceCode Vortex VT100 passive low-frequency (LF) RFID tags are attached to bags of blood sent to the surgical suite. With the RFID technology, which the NSW Health Pathology lab has been using since December 2013, approximately 1,000 products are tagged annually. SpaceCode Vortex VT100 passive low-frequency (LF) RFID tags are printed and applied to blood being sent to the surgical suite. Most of the blood bank’s inventory is not delivered to the operating rooms, and the blood bank determined that it would need to tag only those bags being used on surgical patients. By tagging only products destined for the operating room, the laboratory saves labor time and overall tag cost. Each employee is assigned an RFID staff access card with a unique ID number encoded on the card’s embedded RFID chip. That ID is linked to that individual’s identity in the SpaceCode Smart Tracker software. When a worker completes training, Greenfield activates that individual’s card, which grants him or her access to use the RFID-based system. When a surgery patient needs blood, the hospital contacts the blood bank, which selects blood matching that patient’s blood type. In addition, it electronically cross-matches the blood in the pathology lab’s information system (Cerner‘s Pathnet system). A blood bank employee removes the cross-matched blood from the laboratory refrigerator, then attaches an RFID tag to the bag after associating the blood, the tag and the patient in the Smart Tracker software. That data is then stored in the software. 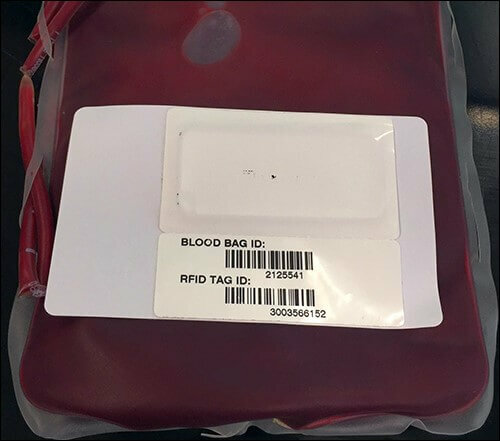 Bags of blood are dispensed from the lab by scanning the bags’ tags via a low-frequency(LF) RFID reader and transporting them to the hospital’s surgical ward, where a staff member uses his or her ID badge to access the locked RFID refrigerator and place them inside. If blood is required, the fridge prompts the theater personnel to enter the patient’s unique medical record number, and to select the patient presented on screen after confirming that the person’s name and date of birth match. The worker then scans his or her RFID staff access tag to unlock the refrigerator and remove the appropriate blood. Once the door closes, the unit’s built-in RFID reader interrogates the tags, confirms which bags of blood have been removed and creates a record of who removed the blood and when. If the wrong blood is removed, then the user receives an alert. 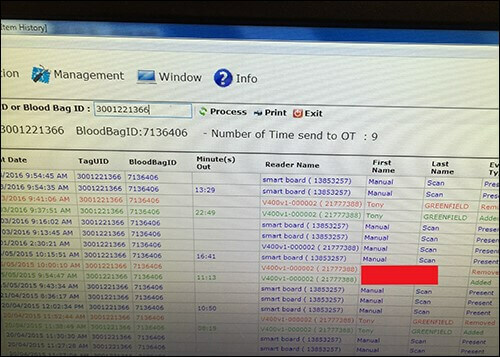 The Smart Tracker software determines how long the blood has been out of refrigeration and alerts the user if it has been out for more than 30 minutes. If any blood is not used on that patient, the theater staff member goes through a process to return the remainder to the refrigerator. The software determines how long the blood has been out of refrigeration and alerts the user if more than 30 minutes have passed. The bags are later sent back to the blood bank, where the tags are read again as they are put back into refrigeration. A record of all actions taken with each bag of blood is then displayed, so that the staff can decide whether to return it to inventory or quarantine it for possible discard. With the RFID-based system, the blood bank can be assured that only properly stored blood bags are returned to inventory and are available for safe reuse.